Find out more about the rollerblinds your designs will be printed on, along with some of the product options available from our trade partners. At Luxury Blinds Direct, we specialise in printing high quality digital images onto roller blinds. We use the latest printing technology available to ensure you get the sharpest image on your blinds. And the blinds we use are of equally high quality. Our roller blinds come direct from our parent company, Stevens (Scotland) Ltd., the leading manufacturer of quality blinds in the UK, so you know you are getting the best. Roller blinds are a hugely popular and versatile window blind product, for a variety of reasons, including effective light control, longevity, and they’re easy to clean. Our roller blinds are available with a wide variety of options, which you may wish to consider for your new blind. The control is the cord or chain that is used to adjust your blinds. The standard control for our roller system is the popular endless chain system. This is simple to operate and provides great ease of use. It is also very child-friendly thanks to our cord safety device; read more about our child safety policy here. Options for controls include spring operation or motorisation, with a slow-rise as standard. Battery operation is also available, which can be installed without the need for an electrician. Special long life batteries are supplied and will last between 6 -12 months depending on how frequently the blinds are operated. 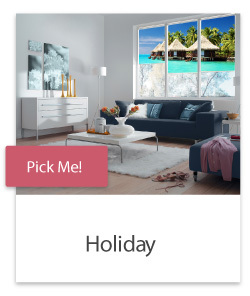 When you are ordering your photo blinds, you will be asked to specify where you want your control to be placed; to the left of the blinds, or to the right. This is entirely up to you. You might choose to put the control on the side that is easiest to reach, the side that is more out of sight, or the side that isn’t blocked by furniture! Cassettes cover the top of your roller blinds, for a neater finish. To really set your unique blind apart the addition of one of our colour matched cassettes finishes the blind off perfectly. When your blinds are being printed, your local trade partner will be in touch to talk about your cassette options. If you have any other questions about our products, please get in touch by emailing us at enquiries@luxuryblindsdirect.co.uk, or calling us on 01356 628 428.